On two occasions, both in school and daycare, my daughter’s teachers pulled me aside to share that “she doesn’t speak to adults, only to other children”. When it first happened at daycare I rushed to ‘Dr Google!’ and in less than five minutes I had her diagnosed as a ‘selective mute’. Thankfully my husband talked me off that cliff! In each instance, my Mama brain jumped to wanting to fix my daughter, wanting to control the outcome, and help her transition to where she ‘should be’ which was more like other kids her age. So when it popped up again last year, when she was six, I initially launched into fixing mode. I explored a hearing test, speech assessment, confidence and resilience skills – you name it. The hearing test did show us she needed new grommets, which helped a little , but even afterthat she only transitioned to one or two word exchanges with her teachers. The weird thing was that at home and with her close friends she was non-stop chit-chat. One day,during a meditation, I received the messages that perhaps she isn’t broken and I should choose to accept where she is instead. As an Intuitive Coach I know that we are perfect just as we are and that everything unfolds for a reason. So perhaps it was time to embrace this as a parenting approach too. Maybe she didn’t need fixing? Maybe she was just quieter than other kids? And that’s OK. Within a few months I had an epic proud Mama moment as I watched the same girl volunteer to sing ‘Supercallafragalisticexpealldosus’ in front of the whole school as part of the school talent quest. She is more confident now at participating in discussions with her teachers. That doesn’t mean she’s fixed, but that’s because she wasn’t broken. This is your child’s journey of discovering their self-expression, not yours. It is OK for them to navigate how they express themselves in their own unique way. They are not broken: catch yourself if you’re in the gap of worry focusing on where they ‘should be’. Your role is to love them unconditionally for exactly where they are. Become aware of whether or not you jump in to answer questions on their behalf if they are being shy. Instead allow for silence, doing this knowing they are not broken will create a less anxious environment for them. Know that this is an invitation for you to explore why you are perhaps uncomfortable with silence yourself. All external life experiences are an invitation from the Universe to look inwards. It is amazing to see my daughter grow in confidence. It’s also exciting to see her do it as she chooses to. It’s a much less stressful approach for both of us and I’d choose that any day over being in the ‘should be’ gap of worry. 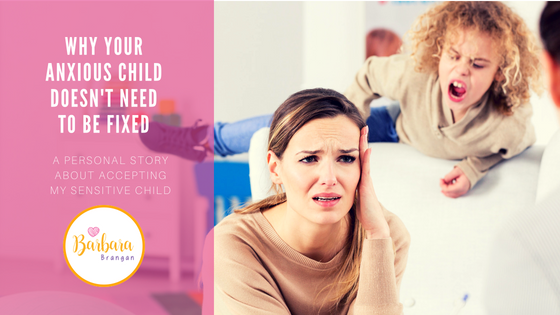 What can you choose to accept about your child today?